After more than a decade of pioneering virtual scrapyard surveillance in 38 states, my childhood friend and colleague, who has recently passed, Brad Gladstone, had seen one too many scrapyard operations burn down due to recalcitrant fires. Gladstone was determined to design a solution that would end the threat of fires for his metal recycling customers. His mission was to develop the first and only solution able to proactively detect and suppress a fire before a major catastrophe. On September 5, 2015, after years of development, the first ever scrap fire was remotely extinguished by his solution—cooling two hot spots within seconds, prior to the flames ignited, in Nashville TN. Since that time, Fire Rover has ensured that no major fire incidents have occurred at any of the facilities it protects. Historically, no formal tracking of waste and recycling industry’s fire occurrences has been documented—until early 2016, when I started tracking reported waste and recycling facilities fires occurring within the U.S. and Canada. My research tracks “reported” fires, meaning only fires that are reported and published by a news agency—since there is currently not a governing agency requiring recyclers to report fire incidents. It is widely agreed in our industry that there are many fire incidents that are not reported, which by my estimation is almost 6X the amount of reported fires. 2018 was especially interesting, as we saw a significant increase in fire incidents, specifically during the front half of the year. Could the stockpiling of inventory due to China’s recycling restrictions, the increase of lithium-ion batteries in our waste stream, or simply just the increased level of heat and dryness be the culprit causing the increase of fires this year? Our industry has seen a 26 percent year over year increase in fire incidents in 2018 as compared to 2017 and a 34 percent increase over 2016 (see Figure 1). 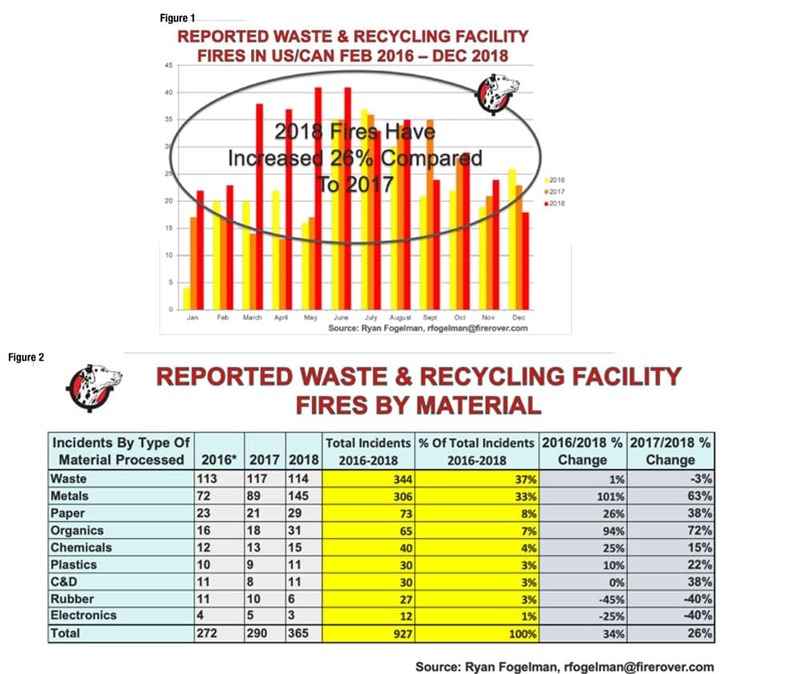 At the end of each year, I compile and analyze the fire incidents in the “Waste & Recycling Facility Fire Annual Report,” comparing prior years’ data to pinpoint trends. The most disturbing trend I am seeing this year is related to the metal recycling industry (see Figure 2). Fires at metal recycling operations have increased by 63 percent in 2018 as compared with 2017 and have more than doubled as compared to 2016. Additionally, we have seen a steady increase in metal fires as compared to the waste and recycling industry (see Figure 3). In 2018, metal fires outpaced waste facility fires as the largest contributor of reported fires in the U.S./Canadian waste and recycling industry. 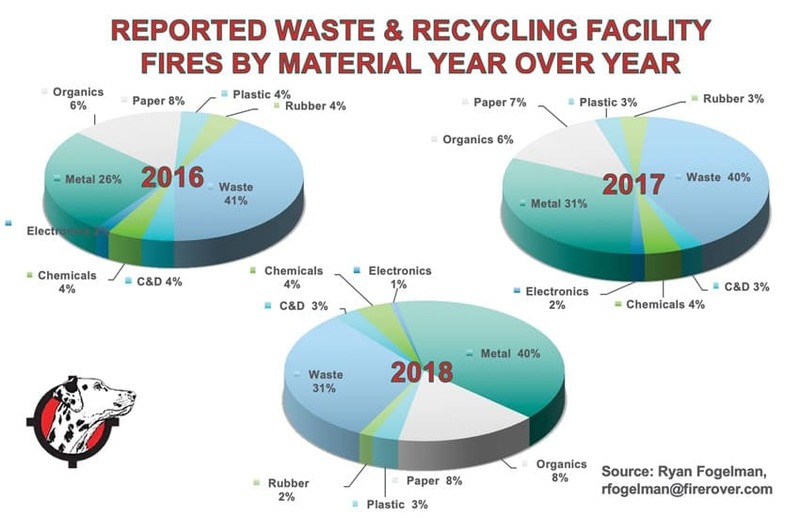 As you can see from Figures 1 to 3, the number of reported fires in our waste facilities have remained steady with increases in organics, paper and plastics, but it is pretty clear that the largest increase in 2018 stemmed from a significant increase in metal recycling facility fires. The byproduct, or residue created during the ferrous metal recycling process is flammable by nature, and has recently been further catalyzed by the influx of lithium-ion batteries that are entering the recycling stream, as manufacturers are implementing these into their products—creating an inherent unavoidable fire risk. So, now that we know that there is an issue, how do we stop these events from occurring? Since our initial fire elimination in 2015, not only have we been able to proactively protect our clients’ operations from fire incidents, we have been fortunate to have a front row seat identifying how these fires are starting at recycling operations. Typically for our metal recyclers, potential fires are detected within in the in-feeds and material piles, but there are also fires igniting within the processing equipment, and even in the outbound material. We often see local media outlets chastising the metal recycling industry and allude to unsafe practices after a fire incident occurs with quotes from the general public about their experiences living next to a facility. I simply see it with most waste and recycling operations that there is an inherent vulnerability to experiencing fire in the recycling industry—but fortunately there are a number of ways to control it. The fact is that metal recyclers who are OSHA compliant and run their businesses with a “safety-first” mentality are still subject to the inherent risk of fire. Unfortunately, the risk of fire is not 100 percent avoidable by safety best practices, or operating protocol—the risk is a direct derivative of the material, we are recycling and the means to recycle it in order to create a greener and cleaner planet. Our communities bestow on our industry the difficult task of processing recyclables for reuse, but the truth is that flammable hazards, such as propane tanks, gas tanks, coal, fertilizers, hazmat, cigarettes and chemicals, are comingled in this material and need to be dealt with. According to the EPA’s Advancing Sustainable Materials Management: 2015 Fact Sheet published in July of 2018,1 metal and aluminum recycling operations accounted for recycling of 8 million tons of material, and more than 250,000 jobs and $14 billion in wages and taxes. Simply put, our goal is to dispose of the least amount of any material in our landfills. Scrap metal recycling’s vastly positive impact to our economy and environment are often forgotten about, as the media reports large explosions from shredder mills, and the aftermath of thick smoke that seems to billow throughout the year. There is a wrongful stigma that scrap metal is inherently dangerous. Yet, when controlled properly, although explosions are a part of the daily operations, they do not have to be as dangerous or impactful as the media creates them to be. The alternative solution of landfilling all material at end of life is not a reality that most people globally would want to see. Fluff fire incident at metal recycling facility detected using thermal imaging cameras and suppressed remotely through Fire Rover solution. Image courtesy of Fire Rover. No matter what the public opinion of metal recyclers, the fact remains that their risks can be mitigated with the proper planning and investment in technology and tools. Most businesses have some type of controllable risk, the key word being “controllable.” That does not mean that bad operators are off the hook, but the risk of fires cannot be ignored when we know there are ways to plan for the inevitable when they come. Anyone that is in the business of firefighting understands that every incident is unique and 100 percent preparation, although ideal, is an impossible task when no two incidents are identical. However, there is a solution—developing the proper fire preparedness plan, extensive employee training and investment in proactive detection of firefighting solutions (see Investing in Protection sidebar). There are multiple industries that are critical to our recycling infrastructure that have an inherent risk of fires. As the public, you should expect businesses to do all within their power to mitigate the risk of harm to the local, regional and global communities. With proper planning and investment in proactive detection and suppression tools, we can go from reacting to potential fire incidents to attacking, controlling and eliminating them. Ryan Fogelman, JD/MBA, is VP of Strategic Partnerships for Fire Rover. Ryan is focused on bringing innovative safety solutions to market. Ryan has been compiling and publishing the “The Reported Waste & Recycling Facility Fire in the US/CAN” since 2016, the “Waste & Recycling Facility Fire Annual Report”, and speaks regularly on the topic of scope of the fire problem facing the Waste and Recycling Industry, detection solutions and onsite proactive suppression solutions. He can be reached at (614) 327-3744 or e-mail rfogelman@firerover.com. After a long-time customer mistakenly dropped off a pallet of magnesium turnings to Cohoes, NY based scrapyard, NH Kelman, the material was quickly identified by the scrapyard staff, segregated and, per company protocol, the customer was immediately contacted to remove the material. While waiting for the customer to return, and due to the high summer heat and water caused by rain, the magnesium ignited causing a fire incident in the segregated material. Experts revealed that NH Kelman handled the situation to the best of their ability and their emergency response plan was in place, but unfortunately the media wrongly cited Kelman of unsafe practices due to the magnitude of the incident. Since the event, Kelman has made a number of major investments to update their disaster recovery plan, including Fire Rover systems, which will use 24/7 military grade heat monitoring to identify potential fire hazards before a fire starts, and can quickly dispense an EPA friendly foam fire retardant—remotely—even when no personnel is on site. This improvement alone, will ensure the safety of local fire fighters, personnel, the environment and the greater community. Kelman has joined a long list of metal recyclers across the country that have made a significant investment and commitment to safety of their operations. Even as the number of fire incidents at metal recyclers have almost doubled within the past few years, not one of Fire Rover’s clients’ facilities that are protected is among the victims.